The industrial control system adds a number of convenience features as well as providing critical safety controls that protect your employees. The US National Electrical Code (NEC) requires an electrical disconnect within sight of the parts washer. Integrating the disconnect into the machine control panel satisfies this requirement at lower cost than installing a separate disconnect in your plant. Additionally, the Industrial control system adds the reliability from an electrical system designed and built to ANSI/NFPA 79 Electrical Standard for Industrial Machinery – Latest Revisions. The StingRay Industrial Control Electrical system meets one of the most stringent design standards in the world for reliability and safety. 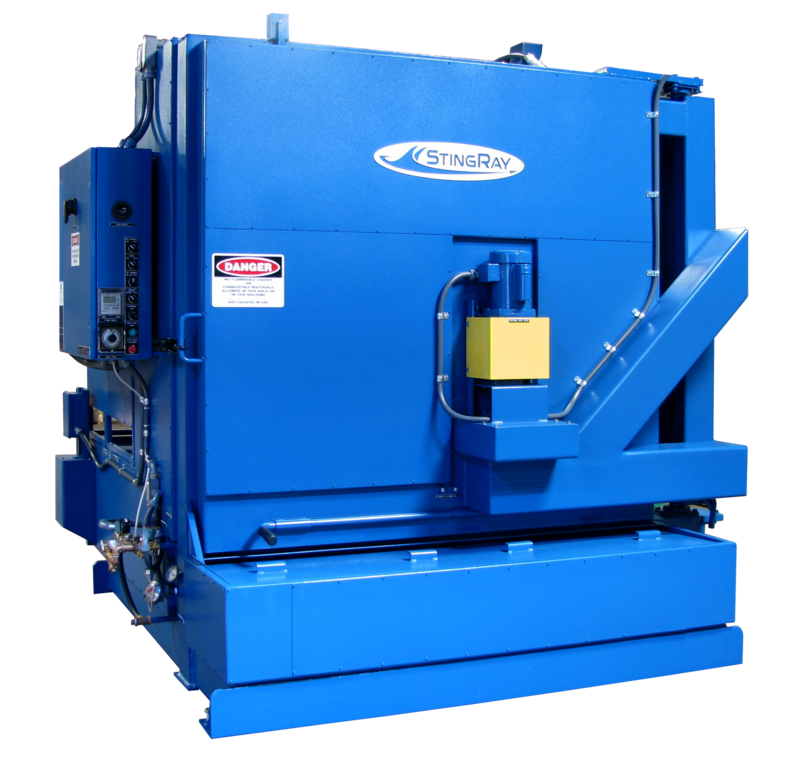 Safety electrical disconnect sized for full load of parts washer for simple, cost effective parts washer installation to meet NEC. Allows safe entry into electrical enclosure for adjustment and servicing of equipment. Labels on all devices to NFPA 79 Codes for ease of maintenance and service. Machine lifting lugs for simple installation in plant via overhead lifting. 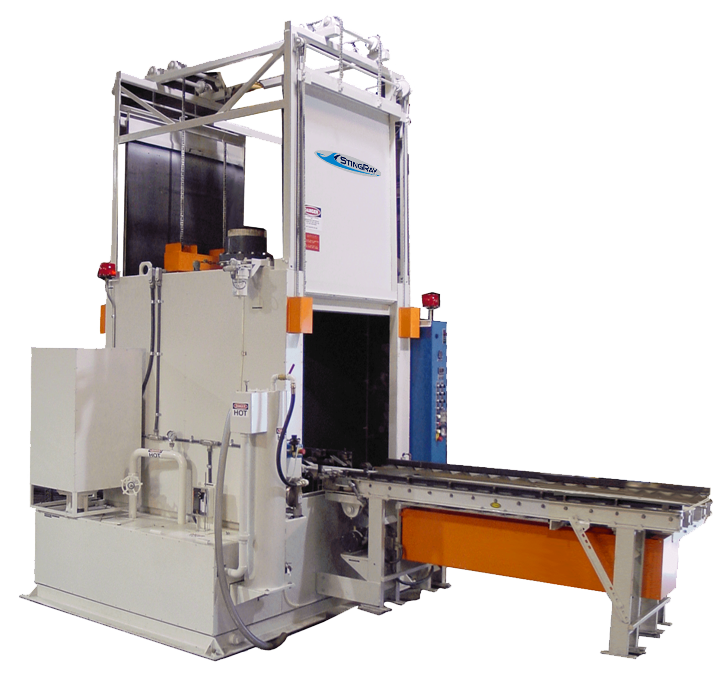 Turntable jog for easy positioning and inspection of parts wash load after cleaning cycle. Control panel-mounted heavy-duty industrial selector switch meets NEMA 12 requirement for reliability and long economic life. Clock override for simple bypass operation on Non-programmed days. 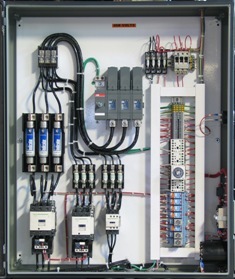 Control panel-mounted heavy-duty Industrial NEMA 12 lever-type operator switch for reliable system activation. Door position lock to stabilize the turntable and prevent movement for safer loading and unloading, and for clean outs and servicing of reservoir. Lock is spring loaded and is easily operated from the door handle to save time. 2 inch reservoir drain with cap located at low point of reservoir for easy clean out. Provides connection to waste water treatment system. Fresh water back flow check valve to meet local codes for potable water supply connection. Hour meter to maintain total operating time of parts washer. Indicates when it is time to perform the preventative maintenance procedures.